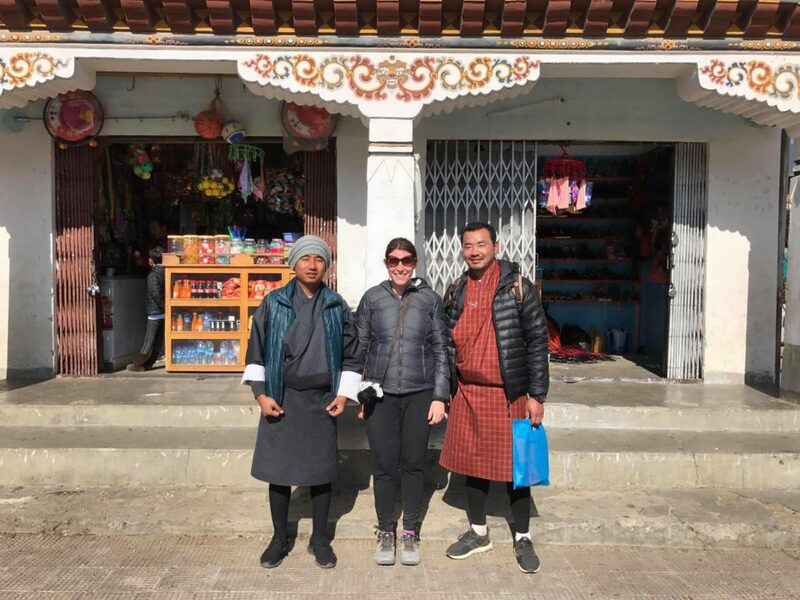 In late January, I finally checked off a bucket-list item I’ve had since I was 12 years old: visiting Bhutan, also known as the Land of the Thunder Dragon. I started collecting postcards with my grandmother, Nana, when I was 10 years old and a couple of years later, I received a beautiful postcard from Bhutan. The people in the postcard were wearing their beautiful natural dress and the mysterious and alluring Paro Taktsang, also known more commonly as the Tiger’s Nest Monastery, was shrouded in a layer of fog. I had no idea where Bhutan was located so I went to the school library and did as much research as I could by using our encyclopedias. I knew that one day I would visit Bhutan but I didn’t realize it would take 23 years for it to happen. 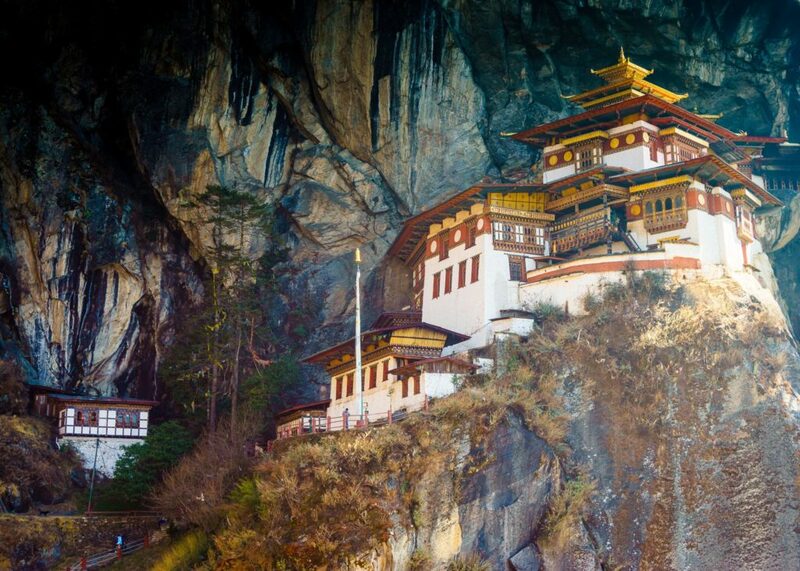 Bhutan isn’t the easiest country to visit. 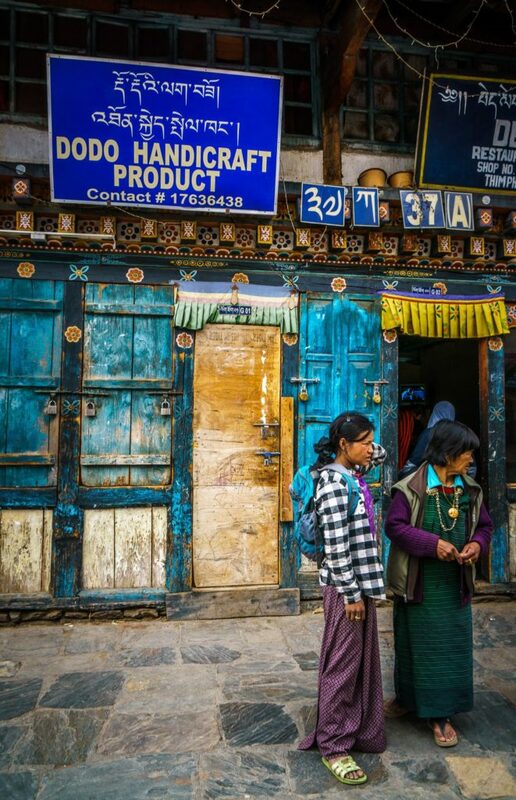 Their strategy around tourism is “high quality, low impact” which means that there are some barriers to visit that aren’t in place for nearby countries like Nepal. 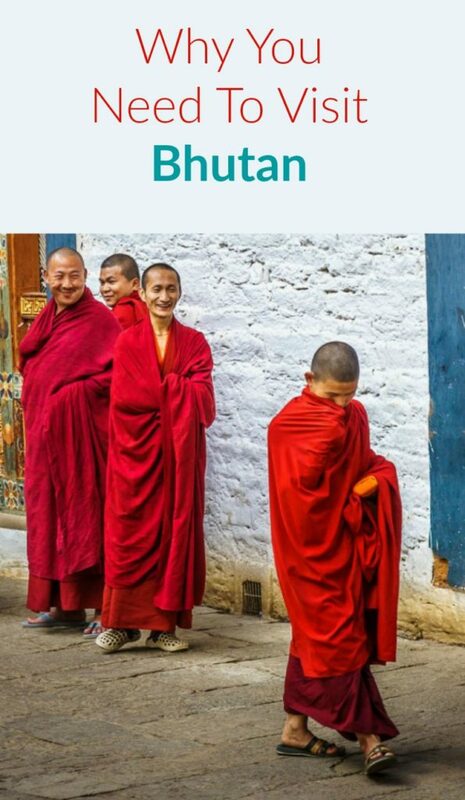 In a future blog post, I’ll talk in more detail on how you can plan a trip to Bhutan. The country is not overrun with mass tourism the same way other countries like Nepal, India and Thailand are. The government imposes a $250 per day for all tourists, except those from India, Bangladesh or the Maldives. While that may sound steep, the cost includes your accommodations, guide & driver, entrance fees and food. A portion of the daily tourist tariff (35%) goes towards free healthcare, education and tourism infrastructure. I am a self-proclaimed spicy food addict and have been known to visit Santa Fe, NM just so that I can get my fill of hatch green chili. I was happy to discover that Bhutanese cuisine is also incredibly spicy and almost every local dish has just as much chilis as veggies & meat. Within the first few hours of my arrival, I told my guide that I want to eat at local restaurants whenever possible since I’m not a huge fan of hotel buffets. He warned me several times that the food is incredibly spicy and most tourists can’t tolerate it. I think both he and the tour company manager were amused when I ate all my food at a local restaurant in Thimphu. One of the most well-known dishes is Ema datshi, a spicy dish made with green chili peppers in a cheesy sauce. When I took my first bite of Ema datshi at the hotel, I mistakingly thought the green chili peppers were green beans. Whoops! At least I enjoy spicy food. My favorite dish though, had to be Kewa datshi, which is potatoes with red chili peppers in a cheesy sauce. If you can’t tolerate spicy food, don’t worry. The hotels serve a mix of Indian/Chinese/Western food so you can avoid the local food entirely if you wish. 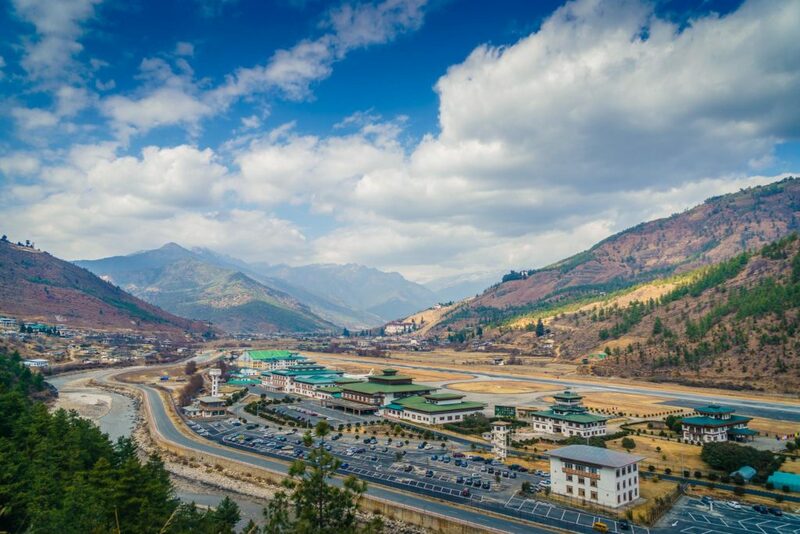 While there are a few international chain hotels, such as Starwood’s Le Meridien Thimphu and Le Meridien Paro, no chain restaurants or stores exist in Bhutan. You won’t see a single McDonald’s, KFC, 7/11, etc. The only country I’ve traveled to that had zero western chains was Cuba, although that’s quickly starting to change. There’s a lot of to see in Bhutan but there are no big cities with your typical traffic jams and crowds. The capital of Bhutan, Thimphu, only has 170,000 residents and zero traffic lights (although there is one man directing traffic at the largest traffic circle). Much of my time was spent walking and taking in the fresh air and beautiful scenery. Although my hotels had wifi, the signal was very weak, making it too difficult to check work email, which enabled me to unplug the entire time I was there. Bhutan is an incredibly unique. They have more monks than soldiers. No traffic lights or fast food chains. There’s a national dress code. Traditional architecture must be maintained. They’re one of the few, if only countries, to measure their Gross National Happiness and until 1999, they didn’t have access to the Internet or cable TV. Even today, only 40% of the citizens use the Internet. Walking around in Thimphu, you’ll see some teenagers and other folks in a sweatshirt and jeans, talking on their cellphone but it’s still much more rare to see western dress than the traditional kira or gho. 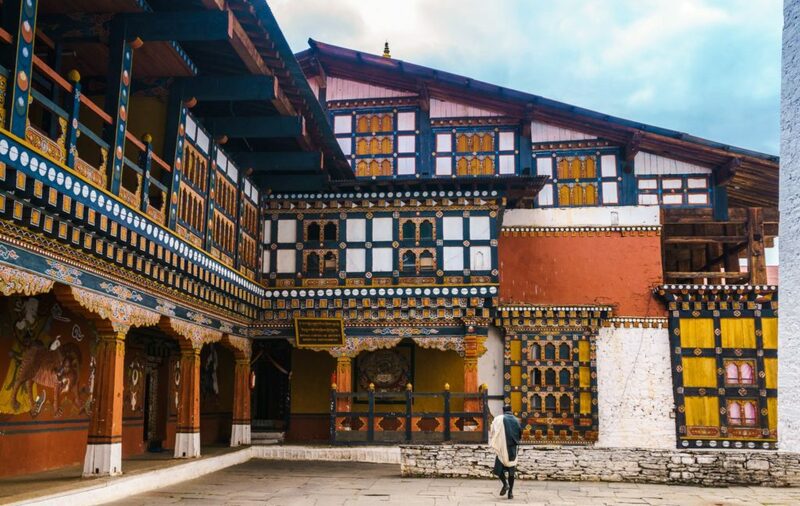 As a visitor, you won’t see hordes of tourists but you’ll have the opportunity to observe daily life in the temples, villages and even in the capital, Thimphu. 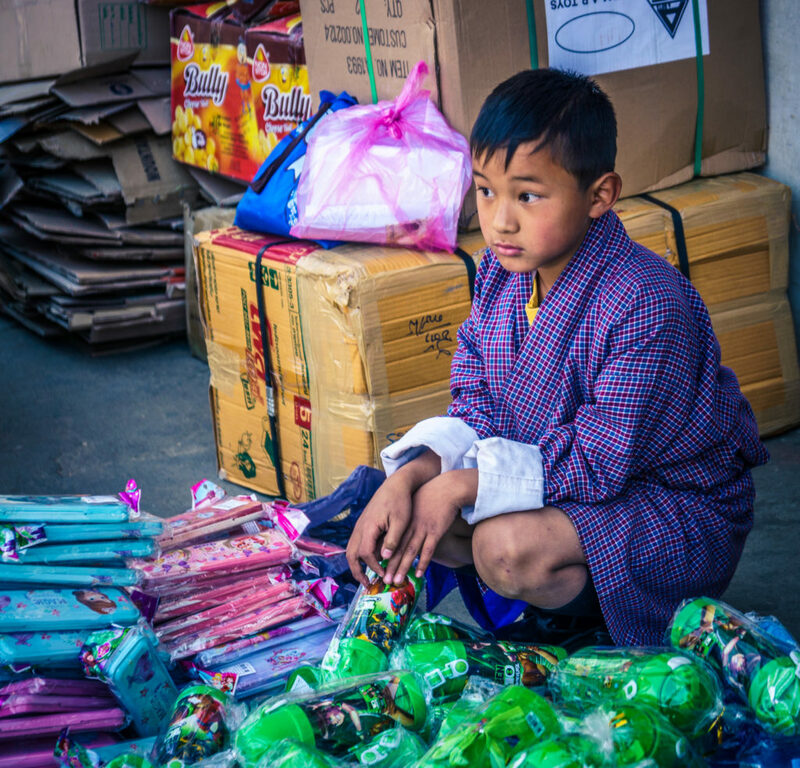 When I wandered around Thimphu, it was the day before the new school year and parents were rushing to buy backpacks and school supplies. When we were driving down the road in Punakha, the driver pulled to the side of the road and told me that the entire royal family was passing. Apparently it’s not uncommon for tourists to have encounters with the royal family, given that it’s such a small country. People in Bhutan genuinely love the royal family and you’ll find their portraits in almost every home, restaurant and temple. 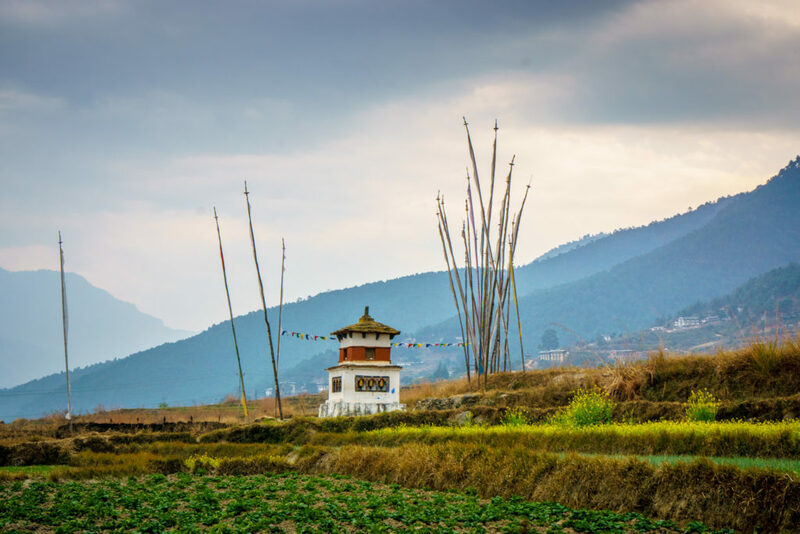 The town of Punakha is also home to an unusual buddhist shrine, Chimi Lakhang, dedicated to Drupka Kunley. Kunley is better known as the Divine Madman as well as the “Saint of 5,000 Women.” Due to his teachings, you’ll see cartoon-like phalluses painted on homes in business in Punakha as well as other small towns, which are thought to keep demons at bay. While it’s possible to travel overland via India, most visitors to Bhutan land in Paro, flying on either Druk Air or Bhutan Airlines. Part is considered one of the world’s most dangerous airports due to the unique landscape and there are only ~25 pilots qualified to land there. Paro is surrounded by peaks as high as 18,000 feet as well as small hills close to the airport. Flights are only allowed to land and take off during the day. If you fly from Delhi to Paro and sit on the left side of the plane, you’ll also have an amazing view of Mt. Everest. I had 5 full days to explore to Bhutan and I look forward to returning one day, possibly during festival season. 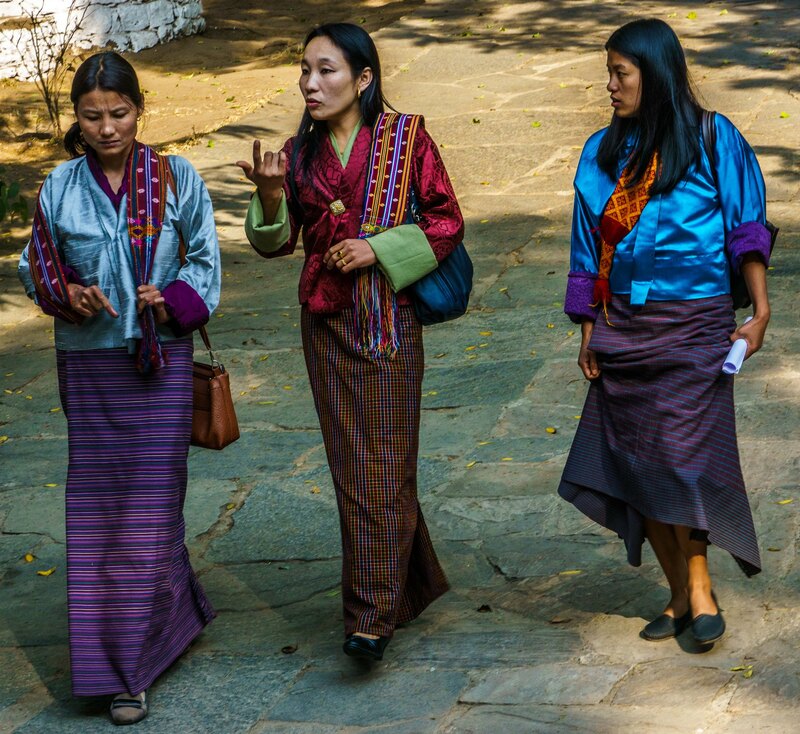 In a future article, I’ll share some practical tips and advice for booking a trip to Bhutan. OMG Girl! I’ve had a dream to go to Bhutan forever now! 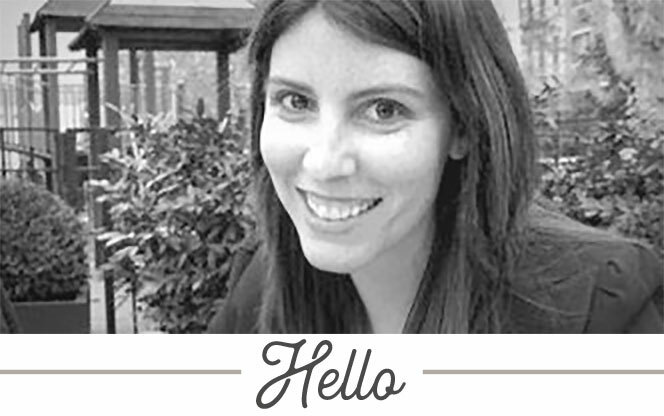 Becoming a single mom has put my dream on a bit of a hold but it’s so great to see it through your eyes. This place is so dear to my heart and I couldn’t say why really. I just know it’s special and I love so many things about it. I researched a ton and learned everything I could about it reading and watching documentaries. I am so jealous (in a good way) and can’t wait for your next post with MORE PHOTOS AND VIDEOS! C’mon, I know you have them. Let us live vicariously through you LOL! OH Ema Datshi! So delicious. I was obsessed. I kept eating even when my eyes were watering and my nose was running and my face was bright red. 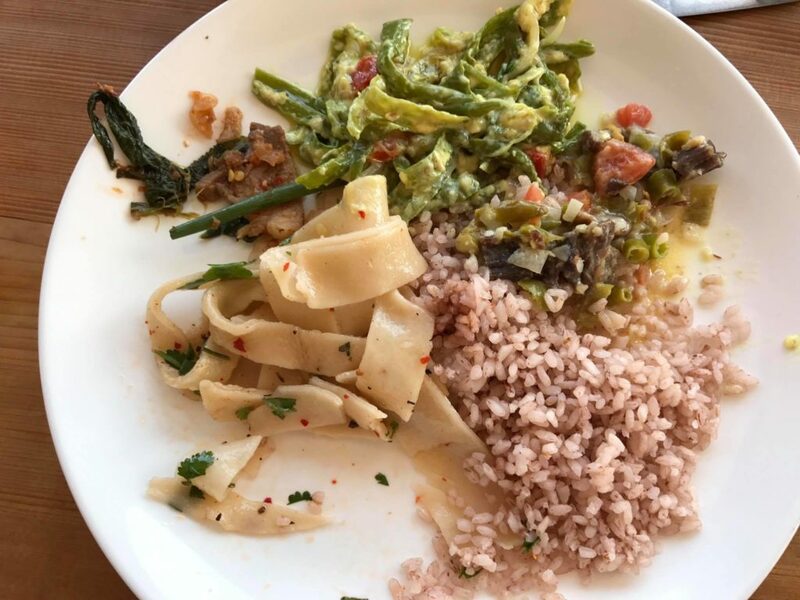 We had some absolutely delicious food in Bhutan. We too crossed the land of the thunder dragon from our bucket list and are SO glad we did. I would also go back for a festival, or perhaps to see more of the harder-to-get to eastern parts? Can’t wait to read more of your Bhutan-tales and reminisce.